It’s easy for some people to be displeased with how their arms look. Many consider that arms that are too fat do not allow them to wear the clothes they like. They feel like their body image is ruined, in spite of an otherwise harmonious physique. If you avoid showing your arms or are not particularly proud of them, this article is for you. Below, you will learn important aspects of arm fitness and of fat removal, along with efficient exercises to help you look better. Individuals who are displeased with their bodies tend to focus on what they perceive as wrong and forget to take an in-depth look at the possible causes. Their arms may simply be fat, especially when there is an overall issue with excessive weight. Fat accumulates on arms and even under arms; it usually happens so when one consumes less calories than they eat. Also, not exercising means the stored fat cannot melt – it certainly won’t go away on its own. Lacking in this particular field leads to another issue and a frequent cause of bad looking arms: flabby skin. There are people who aren’t necessarily overweight; in fact, they’re quite healthy and supple. However, their arms keep them displeased because they’re not toned. When one dedicated time regularly to exercise, the skin tightens around and the arms get toned. To improve their aspect, one has to take both issues into consideration. Exercise could be more important than dieting and losing weight in your case. For this reason, we have chosen 15 exercises proven to boost your confidence and beautify your arms from one end to another. These target not only the arm muscle groups, but also many others, so the benefits are numerous. Besides, ditching arm flab becomes easy and the progress is quickly visible when you hit those muscles from different angles. Learn the exercises presented here and you will see what such approach can do. 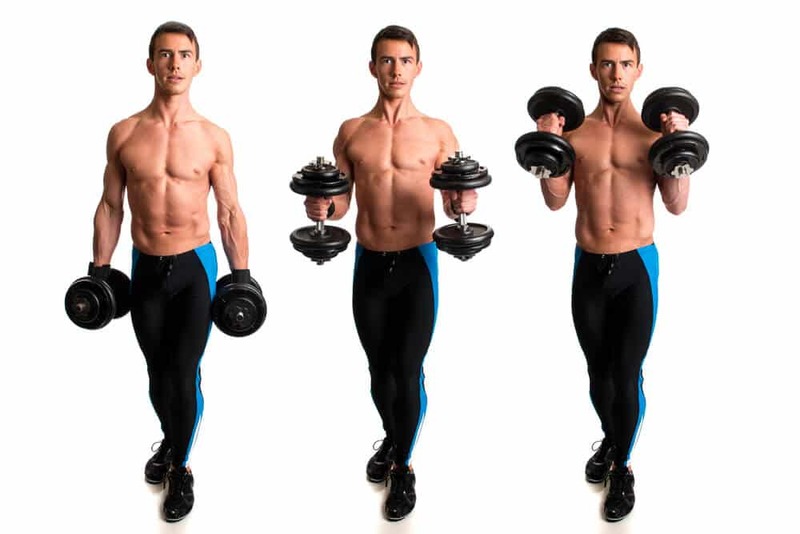 Hold one dumbbell in each hand. Bend over your upper body from your waist and maintain this position. 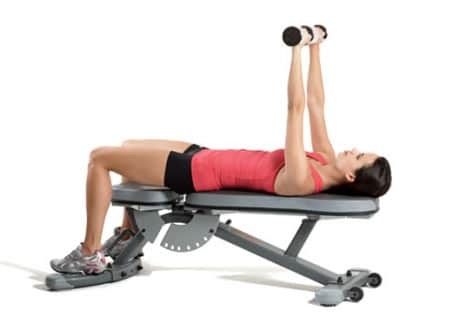 Extend your arms towards the floor then bend your elbows and bring the weights to your chest, simultaneously. It has a good effect on your core and gives you a deltoid, bicep and back workout. While you perform, you must keep your feet slightly apart and the knees relaxed. Do not arch your back but maintain it flat. When you begin the move, simply roll the elbows towards the ceiling. Stand up straight, with your feet slightly parted. With dumbbells in your hands, contract your core, then bring both elbows in line with your shoulders. Always remember to keep your core muscles engaged. Bring the dumbbells close together, you may even let them touch. The movement is very easy yet highly effective. You may perform these on the floor, as well as with your core and upper body elevated on a fitness ball or on a bench. Whichever the case, you must ensure proper support to your upper back, because you will be holding one dumbbell in each hand. To sculpt slim arms, extend your arms upward, then bring them down to your chest. The chest muscles are essential in this workout. Obviously, this mainly targets your biceps, meaning the front side of your upper arms. Using moderate weights, stand with your feet apart. Hold the dumbbells with your palms facing upward. Then bend your elbows and bring the weights to your chest, at shoulder level. Bring your arms back to the position you started with and do that slowly every time. This is a well known exercise to fix the flabby tissue. This is surely an iconic exercise fort he fitness and bodybuilding world. You can do simple or alternating hammer curls. Just hold a dumbbell (or two, depending on how many hands you want to use) and stand upright, with your arms hanging down. Use only the forearm for this movement. Bring it up slowly, then lower it back down. You’ve surely seen this done countless times. When you do this alternatively, with your left and right arm, you can focus better on each. This is an equally fun and challenging exercise for flabby arms. Of course, this one too uses dumbbells. You only need to hold one with your both hands, above your head and to your back. Extend your arms to the ceiling and leave only a small distance to your ears. From there you have to bend the elbows and bring the dumbbell behind your head, while you’re keeping the arms close to your ears. Take this movement as far as you can but do not force it. It’s very good for triceps development. The second part of the move is about straightening the arms back up to the original position and avoiding locking. This arm toning exercise is part of everyone’s childhood. You probably did this without being aware of it. Sitting on a bench, chair or other surface, you place your arms one to each side, with the palms firm on the surface. Use your hands for support as you extend your legs to the front and plunge down easily. This means you move your bottom off the bench and lower it, without touching the ground. Next, you move it back up. Your legs may be either straight or bent in front of you, depending on how you feel you’re performing better. Straight legs means greater difficulty, so you may want to keep that for a more advanced stage. Dips are a bodyweight exercise – one that uses only your own weight to get the work done. The key here is to have a narrow grip. This will build more muscle in your upper arm. Stand in the classic pushup position on your toes, on the floor. With a straight back, bend your elbows while holding them to your side. When you’re almost down, bring yourself back up. In the beginning aim for 5 pushups, then increase the number slowly, preferably until you can do 25 in a row. That’s when you know your arm muscles have gotten really strong. Get two dumbbells and stand up, your arms to the side. Your palms must be always facing your body. Raise both arms, while holding one weight in each hand. You should let the distance between the dumbbells grow and thus your arms will be further apart. When you move them back, bring them close to your body again. You must aim for 15 reps. These may look like a ridiculously simple exercise and if it does so, then you’re probably doing it wrong. Contract your arm muscles and perform the rotations this way – thus you’ll feel its effectiveness. Wrist rotations are excellent for jiggly arms, they tone the muscular fiber underneath and bust that fat that conceals it. Start with light dumbbells and stand up. Hold the arms straightened in front of you, horizontally. The elbows and hands must be at shoulder level. Rotate only the wrists, inward and outward. As you’re doing this alternating move, feel your arm muscles and contarct these. This is another exercise you can do while standing. Get small weights in your hands and have your palms face each other. Move one arm upward as if you would want to punch the ceiling. Do not lock your elbow. Pull it back rapidly, while you lift the other arm. You should be able to do this for one minute without interruptions. You may wish to start at a low speed, then perform faster. While most are focused on the biceps, it is actually the triceps muscles that truly define your arms. These are the longest and it makes sense to increase their volume through exercise. Triceps lifts must be done with your upper body bending forward. Lean as you extend and flex one leg, so that your torso is almost parallel to the ground. Now you can grab a dumbbell with the hand opposite to the leg in front and extend that arm backwards, as far to the back as you can. You should do 25 reps for each arm. Remember to switch the leg and the arm. Planking is a great exercise for the whole body, but when you stand on one side and use your arm for support it really gives your triceps a fine workout. Rest on your elbow and use the free arm to hold a dumbbell. Hold it straight in front of you, well extended, then move it upward. We thought there were too simple to include them here – until we tried them. Arm rotations are very tiring, which indicates that the muscles go through a serious effort. Stand up and rotate both arms, extended. Do this consciously, paying attention to how your muscles flex and keeping them straight. Again, simple and effective. 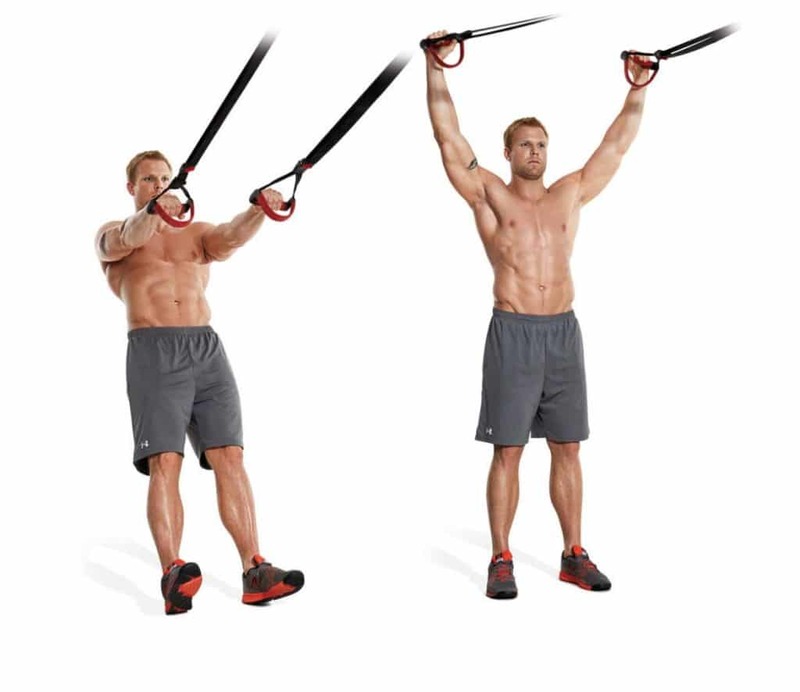 Extend your arms and make scissor motions in front of your chest. This is best done while standing. It’s a good exercise that you can practice almost anywhere, including at your office. Mind your back – hold it straight up at all times. Ultimately, there’s the cardio training, which is the staple exercise to every weight loss protocol. This is because cardio elevates your breathing and heart rate, triggering a whole series of metabolic processes. It speeds up your body’s capacity to use nutrients, including stored fat, as energy. While weight lifting and strength training is for building lean muscle mass, cardio workouts help you trim down the excessive fat. A lot of sports and activities qualify as cardio, therefore you can choose and cycle these however you like. You may dance, jog, run, cycle, use a treadmill, swim, kickbox and so on. Or, you can take aerobic classes. This is the catalyst to efficient fat melting. Cardio burns a lot of calories when you keep up the pace for long enough. However, it is not a targeted kind of work out; in other terms, it does not work on a specific body part but on all of them. As a consequence, you will lose weight overall and melt fat from all areas, your arms included. Here’s a great hint: if you want to enjoy all the benefits of cardio and work your arm muscles at the same time, start rope skipping. Be notified however, this is a high impact sport and may not be suitable to everybody. If your joints are weak or have taken damage, you best avoid skipping rope. You can (and should) combine the exercises above and perform them as often as you can. Training frequently is key – you don’t have to give to much time to arm workouts. It’s enough if you do this for 15-20 minutes on a regular basis, perhaps daily. When the muscular tissue is being used often, it gets prompted to strengthen itself. The effort calls for replenishing nutrients, as these nutrients travel through the blood to reach the stressed out muscular tissue, it repairs itself and grows back stronger than before. This is what the big guys do in the gym when they’re working out with weights. They push and push harder, to achieve more than they did before. Making your arms lean and toned will take at least a few weeks. Don’t believe those who promise ‘miracle’ exercises that solve your problem in just a couple of days. Every pound of fat contains a large number of calories that take effort to burn. Ultimately, if time puts pressure on you, you can schedule a liposuction, which is an easy and quick procedure that uses a chemical cocktail to melt the fat inside, then extract it via a very small tube. You also have the laser version of liposuction.